Unlock the full potential of Selenium WebDriver to test your web applications in a wide range of situations. The countless recipes and code examples provided ease the learning curve and provide insights into virtually every eventuality. Web technologies are becoming increasingly complex and there is a need to test your web applications against a vast number of browsers and platforms, so you need to build highly reliable and maintainable test automation. This book will help you test your web applications effectively and efficiently with Selenium WebDriver. "Selenium Testing Tools Cookbook" is an incremental guide that will help you learn and use advanced features of Selenium WebDriver API in various situations for building reliable test automation. You will learn how to effectively use features of Selenium using simple and detailed examples. This book will also teach you best practices, design patterns, and how to extend Selenium. 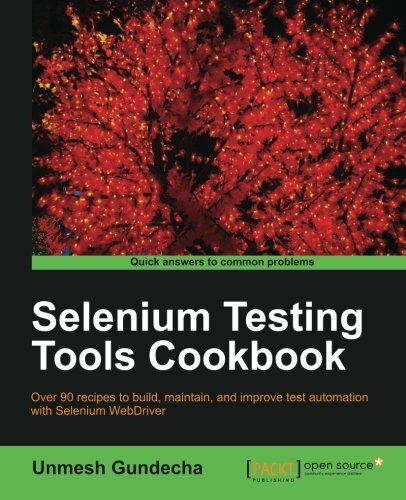 "Selenium Testing Tools Cookbook" shows developers and testers who already use Selenium, how to go to the next step and build a highly maintainable and reliable test framework using advanced features of the tool. The book starts with tips on advanced location strategy and effective use of Selenium WebDriver API. Then it demonstrates the use of design patterns such as Data Driven Tests and PageFactory for building maintainable test automation. It also explains extending Selenium WebDriver API along with implementing custom tasks and setting up your own distributed environment to run tests in parallel. It concludes with tips on integrating Selenium WebDriver with other popular tools, testing mobile web applications, and capturing videos of test runs. This books provides examples in Java, C#, Ruby, and Python. "Selenium Testing Tools Cookbook" will help you in building a highly robust and maintainable test automation framework from start to finish. This is a cookbook packed with code examples and step-by-step instructions to ease your learning curve. This book is intended for software quality assurance/testing professionals, software project managers, or software developers with prior experience in using Selenium and Java for testing web-based applications. This book also provides examples for C#, Python, and Ruby users.